Critical Care Paramedic Tracy Allen has spent the last decade of her life caring for other people’s loved ones. 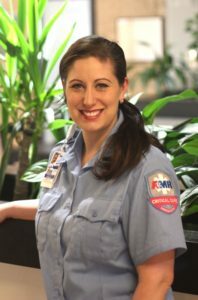 In August 2016, Tracy faced the heart-wrenching challenge of caring for members of her own EMS family. Tracy, fellow Star of Life Honoree Theresa Hartman, and their partners responded last summer to a head-on crash involving an AMR ambulance in which two paramedics were injured. Tracy took command of the scene and provided expert care to her most critically injured colleague. Later, Tracy and Theresa volunteered to transfer their colleague from the initial receiving hospital to a higher-level trauma center. During her teammates’ long recovery process, Tracy was a beacon at local events benefiting the two. Tracy’s colleagues say that this specific case was just one notable incident in a career marked by sacrifice, advocacy, and a commitment to quality patient care.